Photos taken on the Trim, Atbboy Road, opposite Lidl, Sunday 28 September 2008 the day the O'Mahony's beat Summerhill in the Keegan Cup. Although it was a dull day I just couldn't pass without taking a photo. 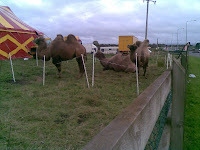 The Bedouin used to say about these ungainly creatures. Ata Alla- God's gift. Evolution has bred them to survive in the harshest of enviroments, and while they do not have the same turn of speed as their more elegant rival the horse, they can maintain a hefty pace for a far greater distance. Domesticated thousands of years ago by frankincense traders, who trained the gangly cud-chewer to make the long and arduous journey from Arabia to the northern regions of the Middle East, the camel went on to become the desert dweller's primary source of transport, shade, milk, meat, wool and hides. To appreciate the unique contribution that the Arabian camel has made to the people and history of desert lands, heres a comprehensive fact-pack on the special characteristics body structure and behaviour patterns of this amazing creature. Camels do not pant, and they perspire very little. Humans start to sweat when the outside temperature rises above the normal body temperature of 37ic but the camel has a unique thermostat. It can raise it's body temperature tolerance level as much as 6ic before perspiring, thereby conserving body fluids and avoiding unnecessary water loss. No other mammal can do this. Because the camel's temperature is often lower than air temperature, a group of resting camels will even avoid excessive heat by pressing against each other. Camels come in shades of brown, from cream to almost black. Unpredictable at best. Camels the reputation of being bad-tempered and obstinate creatures who spit and kick. In reality they tend to be good-tempered, patient and inteligent. The moaning and bawling sound they make when they're loaded up and have to rise to their feet is like the grunting and heavy breathing of a weight-lifter in action, not a sign of displeasure at having to do some work. Fully grown camels measure to a height of 7 foot from their toes to the tops of their humps. Camels have a reputation of being bad tempered and obstinate creatures who spit and kick. In reality they tend to be good-tempered, patient and intelegent. The moans and bawling sound they make when they're loaded up and have to rise to their feet is like the grunting and heavy breathing of a weight-lifter in action, not a sign of displeasure at having to do some work. camels have small ears but their hearing is acute-even if, like the donkey or Basket hound, it chooses to pay no attention when given a command! A camels ears are lined with fur to filter out sand and dust blowing into the ear canal. A camel's eyes are large, with a soft, doe-like expression. They are protected by a double row of long curly eye lashes that also keep out sand and dust, while thick bushy eyebrows shield the eyes from the desert sun. Camels have broad, flat leathery pads with two toes on each foot. When the camel places it's foot on the ground the pads spread, preventing the foot from sinking into the sand. When walking, the moves both feet on one side of it's body, then both feet on the other. The gait suggests the rolling motion of a boat, explaining the camels " Ship of the Desert " nickname. A camel can go 5-7 with little or no food and water, and loose a quarter of it's body weight without impairing it's normal functions. These days, camels rely on man for their preferred food of dates, grass and grains such as wheat and oats, but a working camel travelling across an area where food is scarce can easly survive on thorny scrub or what ever it can find: bones, seeds,dried leaves, or even it's owner's tent! Thick callus-like bare spots of dry skin appear on a camel's chest and knee joints when the animal reaches five months of age. These leathery patches help support the animals body weight when kneeling, resting and rising. A fully grown adult camel stands 1.65mm/6feet at the shoulder and 2.15m/7feet at the hump. Scientists believe that ancesters of the modern camel lived in North Africa at least 40 million years ago, wandering across the Alaskan " land bridge " to Asia and eventually to Africa. In Asia two groups separated to become the two chief types of camel known today: the dromedary and the two-humped, shorter-legged Bactrian camel. Contrary to popular belief, a camel does not store water in it's hump. It is in fact a mound of fatty tissue from which the animal draws energy when food is hard to find. When a camel uses it's hump fat for sustenance, the mound becomes flabby and shrinks. 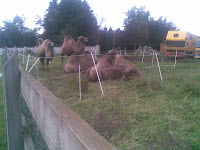 If a draws too much fat the small remaining hump will flop from it's upright position and hang down the camel's side. Food and a few days rest will return the hump to it's normal firm condition. After a gestation periods of 13 months, a camel cow usually bears a single calf, and occasionally twins. The calves walk within hours of birth, but remain close to their mothers until they reach maturity at five years, of age. The normal life span of a camel is 40 years, although a working camel retires from active duty at 25. The camel has a large mouth, with 34 sharp teeth. They enable the animal to eat rough thorny bushes without damaging the lining of it's mouth, and can be used as biting weapons against predators if need be. A camel gulps down it's food without chewing it first, later regurgitating the undigested food and chewing it in cud form. A camels nasal passages are protected by large muscular nostrils that can be opened and closed at will. When a camel twitches it's nose, it is cooling the incoming air and condensing moisture from it's outgoing breath. Normal "amble speed " for a walking camel is 5kph/3mph; a working camel will typically cover 40km/25miles a day. Racing camels can reach 20kph/12miles at the gallop. A fully grown camel can weigh up to 700kg/1542lbs. A camels rope-like tail is over50cm/19" long. 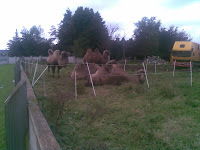 Camels need very little water if their regular diet good moisture-rich pasture. Although camels can withstand severe dehydration, a large animal can drink as much as 100 litres/21gallons in ten minutes. Such an amount would kill another mammal, but the camel's unique metabolism enables the animal to store the water in it's bloodstream. The camels capabilities have been well documented over the centuries, and it's niche in the history of mankind is assured. But as the camel's contribution to desert life today dwindles as the mechanical age continues to advance, it is up to us and to future generations to ensure that this wonderful animal retains a special place in the heart of tomorrows world. I once went for a camel ride in the mountains around Taif, or once I went for a camel ride in the mountains around Taif. Just once! I once rode a camel in Tunisia January 2001. The camel grabbed the edge of my jacket in it's mouth almost pulling me off. I changed over to a donkey and felt more at home. See page 53 of my book " Short Trousers Days in Navan " you will see Sheik Anton McCabe and I on safari in Tunisia. I never rode a camel! They look a too wobbly! !